Most of us feel that our balance should be better than it is. We move about and find ourselves a little out of balance. This usually does not end up with us actually falling, but we don’t quite feel steady on our feet. 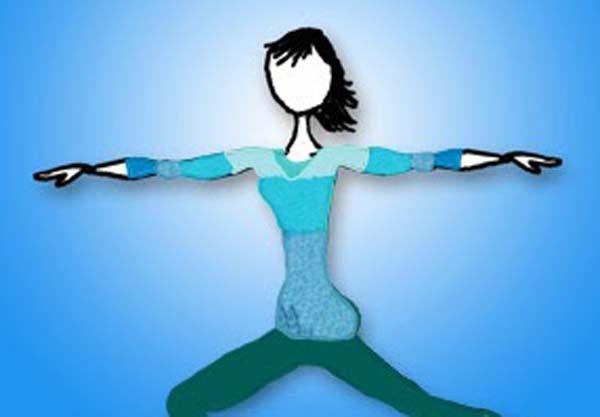 We may feel that our balance is a problem and indeed almost every one of us can benefit from balance training, but most people do quite well even if they sometimes feel a little wobbly. Some however do fall down. The most common reason a person relates as the reason they fall is simply that they were walking and lost their balance. Not walking while juggling, not walking on a tight rope, not walking while carrying unbalanced loads – just walking. I call this kind of issue a ‘failure to walk’ problem and it is a wonder that we all don’t fall down more often. After all, consider the last time you walked anywhere. Chances are that you stumbled or leaned slightly. Chances are that the pavement was uneven, there was an unseen pebble, a patch of slippery ground or in my house, the unseen dog toy. It’s never a banana peel – although they are very slippery, banana peels on the ground are just not a thing in real life. 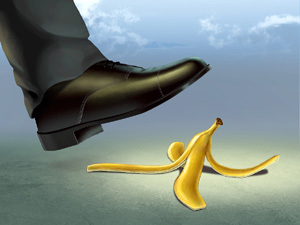 If someone ever comes to me and says they fell down because they slipped on a banana peel I am going to file that one under ‘cartoon injury’ because that is the only place I have ever seen that happen. Some people believe that we are more prone to losing our balance as we age. This is sometimes true, but age is not the main problem. We are more likely to lose our balance when we are unhealthy, when we are recovering from an injury or when we are physically unfit. Age may bring on these problems, but the reality is, we are just as likely to lose our balance at any age. The biggest problem in losing our balance is not regaining our balance. It does not matter how many times you lose your balance if you regain it every time. It is hitting the ground that we need to avoid. I have witnessed time and again individuals who for some reason were very unsteady in balance. The reasons can range from neurological issues, to physical injuries, to inner ear challenges. Although some are incapacitated by these issues, quite a few people manage to get around. Sometimes their acts of balance recovery are extraordinary and very nail biting to witness – these people are literally on the edge of disaster, but somehow they pull it off. The reason they remain standing is because they have learned how to re-balance out of imbalance. Balance training is precisely a training of learning how to create stability out of instability. If we want to balance better we must challenge our current balance. I would add that we need to challenge it safely. Falling down is not a desirable outcome in balance training. With this in mind I thought I would share with you some great tools you can use to enhance your own ‘not falling down’ abilities. For the first challenge you will not need anything at all except a little free space to stand in. I would recommend if you are suffering from balance issues that you have a wall or chair nearby to help ward off disaster. This is the easiest of the balance enhancing techniques, but let’s not start this one on a cliff edge just yet. Stay safe and stay off the floor. Stand with your feet hip distance wide. Slightly bend your knees so they are no longer locked in place. Rock slowly toward your toes and lift your heels away from the floor. Move slowly and smoothly until you feel a slight loss of balance. Restore your balance and then lower your heels to the floor. Now slowly rock back onto your heels, lifting the front of your foot away from the floor. You will lose your balance more easily here and when you do, restore your balance and then lower the front of your foot to the floor. Rock back and forth slowly. Work to keep from leaning forward to sharply or arching backwards. You want you head to stay in line with your feet, so learn to bend your knees and crouch down when you feel your balance slipping. For a greater challenge, step one foot forward as if you have taken a small step. Keep your knees lightly bent and use the same method as above. You will likely lose your balance more easily and you will have to learn to keep your knees bent when rocking backward. If you try the above routine for just a couple of minutes each day, within a week your balance will be better. You will likely still lose your balance, but now your body has had a chance to try out some things and knows better how to restore order. That is the secret of good balance. We must challenge ourselves enough and in enough of a variety of positions that our body has a muscle memory of what to do. There is no time to think when we lose our balance. By the time we can even form the thought “Oh no!” we had better be doing things to correct the problem or here comes Mr. Floor. Since there is not time to think, we must make sure we keep our body practicing so it can react faster than thought. There are quite a few devices out there that can be used to train our balance. I have had a chance to use all of these and they all serve their purpose quite nicely. Each item below will have a different level of difficulty, so it is important to choose something that is a reasonable challenge. The only problems I have ever heard of from these devices is when a person starts off with something too difficult and doesn’t have a ‘fallback plan’. I will list these from easiest challenge to hardest challenge. 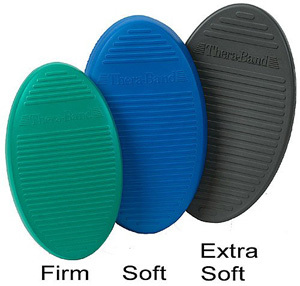 I first encountered the Theraband Stability Trainer while teaching a yoga class at a Physical Therapy clinic. They had a few of these cushions lying around and I tried them out. 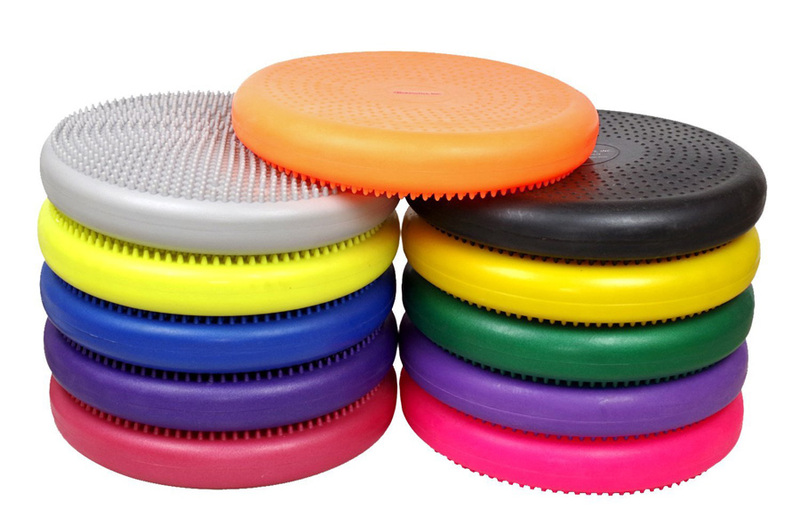 If you have every stepped onto a really thick yoga mat that has a lot of cushion, you will get the idea of this kind of balance cushion. 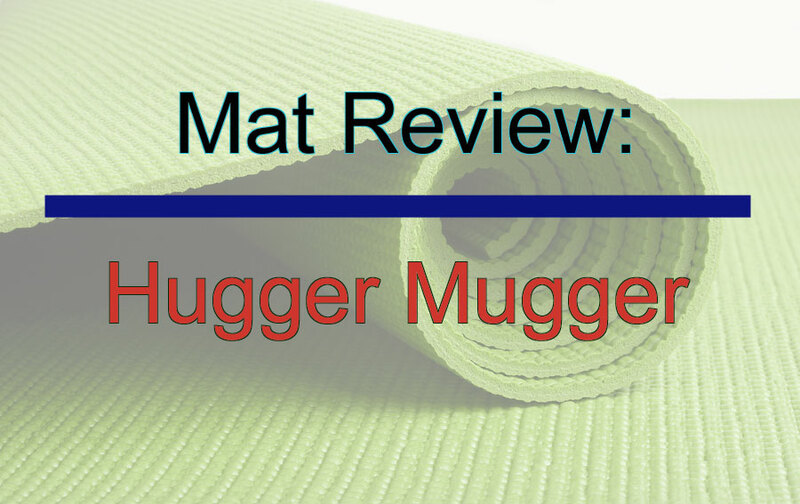 The thickest yoga mat has about 10 – 15 mm of foam. These cushions start at 44 mm thick for the easier firm version and go up to 63 mm thick for the difficult extra soft version. 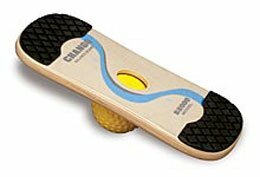 These make a good first balance challenge tool and since they come in a firm, soft and extra soft version you are sure to find a difficulty level that is suitable for you. Aside from being a balance cushion you could easily use these as a knee cushion in yoga for kneeling poses or as a seated cushion for sitting poses. They are durable and attractive and won’t take up much space. In my studio we call these wobbles because that is what you do when you stand on them. 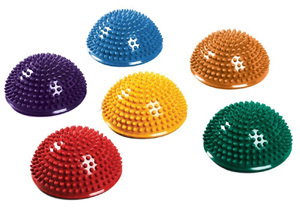 The Isokinetics brand Balance Cushion is a good version of these type of devices. They are constructed of a thicker version of the same substance of physioballs and are inflated to various firmness. The 14 inch disk when inflated will cause you to feel like you are standing on a very thick and unstable balloon. Any slight movement or postural change will be magnified by these devices. 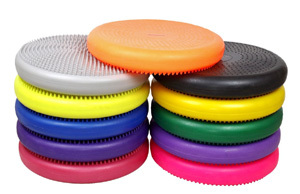 They are about 3 inches high when inflated and one side has low numbs while the other has raised nubs to help keep traction on the floor and under your feet. Standing on one is a greater challenge than standing on two since with one you must keep your feet closer together. We use these to stand on while we do other exercises and it really gives a good balance challenge as well as a core workout. You can adjust the inflation of these and typically the less inflated the easier the balance. Although there are other brands, there is not a lot of consistency of manufacture with some wobbles being extra pliable and thus extra challenging and other being stiff and less challenging. The Isokinetics brand seems to be in between and also offers lots of colors. 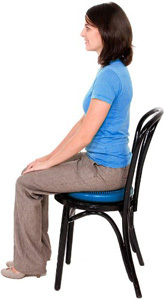 These also work great as a seated cushion to reduce back pressure and if you sit on one and place another under your feet, your sitting position will challenge your balance. I consider wobbles to be great fun and I suggest you get two so you can do more with them. Okay, now we are getting to the more difficult level if we take this picture as an example. 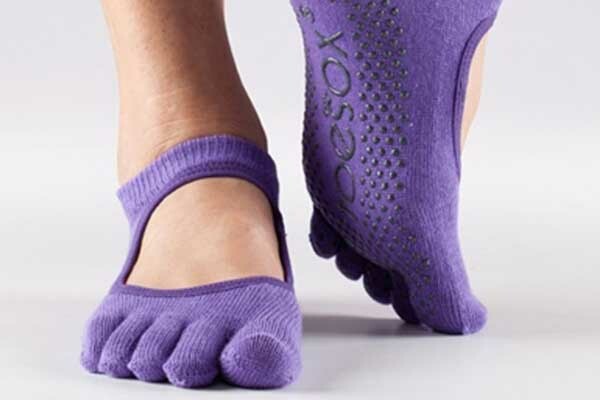 The SPRI Balance Pods are definitely designed to be used under the hands or the feet. They are similar in some ways to the balance cushions in that they are a similar material, but these pods are much smaller with a 6 inch diameter and about 3 inches tall. The rounded nubby side can be either placed face up or face down depending on the difficulty level you want (face down is harder). They are most often used as a walking challenge and SPRI has an instruction sheet that shows you how to set them up. Obviously the super fit girl in the picture is going ‘off sheet’ with her exercise. You can too, but I would start first with just getting used to walking on them. They are sold in sets of 6. Chango means monkey in Spanish, so this is the Monkey Balance Board. The difficulty level of this is such that yes indeed the Chango Balance Board will have you waving your arms like a monkey. I have had one of these for many years and any time I get out of the habit of using it – what a challenge it is to get back into monkey board conditioning. I would definitely not start here with a balance conditioning program since you will come flying off this thing when first getting used to it. I have never ‘hit the turf’ when losing my balance with it, but the challenge is very strong. It actually has two different levels in one board. There are two little balls permanently attached to the board which will give you an easier time. When you place the yellow ball in the holder – that is when you will be doing the monkey arm waving thing on this. It is a lot of fun and great for those who are ready for it – but don’t start with this one. 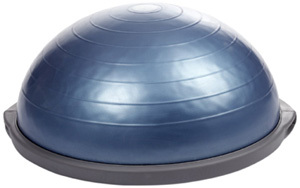 I know these BOSU Balance Trainers are often used in physical therapy and found in many gyms, but they are also a device that I know people have been hurt using them. I am not saying these are a dangerous device, but the challenge they provide is quite strong. Part of the reason I believe people underestimate them is that they look like a tame physioball. After all, it’s just half a physioball stuck onto a flat board right? Well, yes and no. Probably people just try to do too much with these and don’t start with simple actions first before making things more complicated. There are actually two methods of use with the ball side up or the ball side down. You would do well to learn more about the training possibilities with this and the BOSU website has a few training videos. 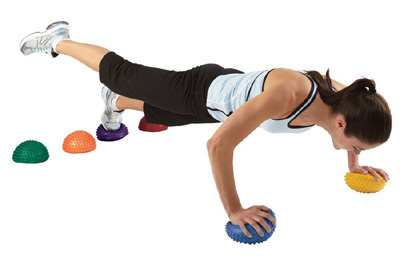 Choosing the right routine for your ability can make this a great balance training device. Remember to be safe in all that you do. There is no sense getting hurt losing your balance while trying to improve your balance. Even with simple actions you will find that a few minutes of practice each day will have you feeling more in control. Take your time and watch out for those banana peels. ← Nutrition: Do we need more sulfur in our diets?